Everyone thrives in sunlight, but most of us spend 90% of our time awake indoors. We often sit deep into the building, far away from windows. Under these conditions we are not able to enjoy the benefits from the healthy natural sunlight. Wellbeing and health are affected negatively, and we do not perform as well as we could. WHAT IS SUNLIGHT AND DAYLIGHT? We often distinguish between daylight and sunlight. Daylight refers to the diffuse natural light that comes from the sky or that gets reflected off surrounding surfaces. Sunlight is the direct light from the sun and is much stronger than daylight. Sunlight is also much harder to utilize than daylight. This partly due that the sun is constantly changing position and it is also often hindered by clouds, trees or surrounding buildings. In addition, it is also way too strong. Daylight can also fluctuate during the course of the day but never so much that it results in blinding. Other advantages with direct light is that it renders exciting contrasts, clear colors, variation during the day, warmth during winter and it also gives you a sense of connection with your surroundings. The circadian rhythm is fundamental to the health and well-being in the long term. Our biological clock requires exposure to darkness at night and the clear blue light during daytime1, especially in the morning2. This should be done in a rhythm of 24 hours otherwise; the clock starts to go out of tune. Disruptions in circadian rhythms leads to direct health problems in the long term3 and also increased risks of accidents. Although the visual system affects our health and well-being. High visual effort in everyday and work-related tasks require light of good quality and quantity. Suitable light provides visual comfort, while inappropriate light can cause eyestrain and cause headache, dazzle and prevent orientation. What we see also affects job satisfaction, mood, motivation, performance and satisfaction with the office environment. It is also the link between the lack of natural light and impaired sleep and increase the risk of serious accidents. Sleep, alertness and performance are directly linked with our 24-hour biological rhythm. Sleep, the effect and quality have all been linked with the natural light. Insufficient sleep causes fatigue, which in turn cause accidents at home and at work. In a new scientific paper leading experts wrote that the main cause of traffic accidents that could have been avoided was not drugs or alcohol, but fatigue. 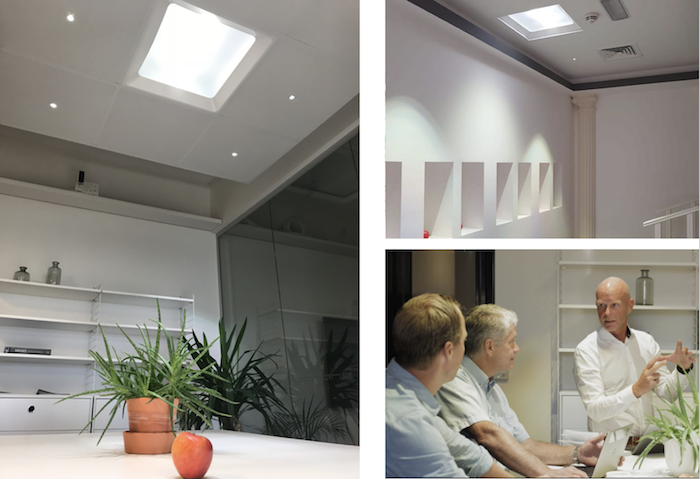 In recent years it has been conducted a lot of research showing the physiological and psychological benefits of natural light. In an extensive literature review from 2012, ”The physiological and psychological effects of windows, daylight, and view at home” the authors state that they only found positive health aspects of natural light. Lisa Heschong, a world leading daylight researcher, describes that when she talks to people who work in day lit buildings, they report about the benefits ”they consistently report how they love working there, and hope they never have to transfer elsewhere”. In the article ”Daylight exposure and other predictors of Burnout Among Nurses in a University Hospital” published in Int J Nurs Stud. 2005, 141 nurses were examined, and it was found that those who were exposed to daylight for at least three hours per day thrived better at work and had lower stress levels. Via the Parans system with thin, flexible fiber optic cables you can get daylight far from windows and deep into the building where the sunlight from windows cannot reach. With the Parans system you are also able to balance the light dynamic in the room with light from the windows. As common as it is to have windows along the facade and that way bring in the natural light, as common it could be to have daylight via a Parans system deeper in into the building. spreads the sunlight over a large surface. the sunlight is spread over the ceiling which gives an illusion that the light comes through an open shaft. the light is spread over a larger wall area like a waterfall – or in Parans’ case – like a light fall. Which light experience suits you the best? 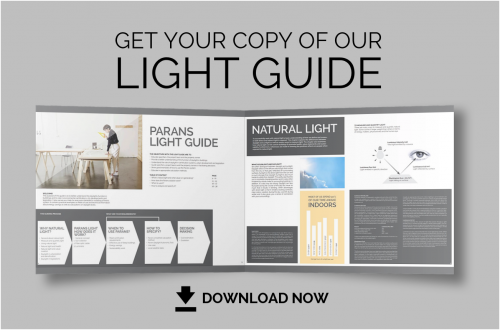 Download our Light Guide today!